But it was signed by Babe Ruth! Dean's Cards has recently put up for sale this beautiful piece of baseball history. This Babe Ruth Autographed Baseball was originally purchased in an auction around 10 years ago. At that time, the owner commissioned an artist to paint a portrait of the Sultan of Swat underneath his signature. The colorful portrait of Babe Ruth adds to the attractiveness of this ball, and makes this a truly unique piece of baseball memorabilia! This autographed baseball would make for a great display item, and definitely give you bragging rights over your friends. The signature is very clean and visible on the ball. It has been certified authentic by both PSA and JSA, and if purchased, will come with a certificate of authenticity. Is your wife or girlfriend still looking for birthday gift ideas to get you? 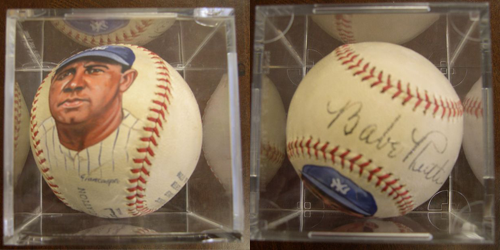 Just think...for a "measley" $24k you have the Babe's ball in your man cave! And not only is it an autographed baseball, this is a work of art, celebrating one of baseball's most beloved heroes. DeansCards.com also has an assortment of other Autographed Memorabilia and Autographed Cards for sale. If you are interested in buying Babe Ruth cards, check out 1933 Goudey Baseball Cards, 1952 Topps Look N' See Cards, and 1961 Fleer Baseball Cards. There's also various magazines and publications bearing the likeness of the Bambino to choose from. Image from the movie "The Sandlot"